Children are exquisite instruments of torture, fine-tuned to each parent. Just a couple examples: Say you’re an introvert with social anxiety; your child will be an extrovert who is miserable every time you stay home; or, just to pull up another random case, you are one of those people with a (completely rational, mind you) terror of vomit. In that case, your child will be a spewer. One of those kids that gets a stomach virus once a month and regurgitates every forty-five minutes for twelve hours straight - all of them at night. I don’t think I need go on. You all know exactly of what I speak. In fact, why don’t you tell me how your children have morphed to torture YOU? Parenting never ends, is largely unrewarded, is considered both very important by anyone who is a parent, yet completely worthless by our existing social structure; and so it seems as if the intersection of parenting and success must be nil. Or null. I’m talking Venn Diagram here. This is no way to live. We need recognition. I learned that from Mr. Dale Carnegie in How to Win Friends and Influence People. At what point can you declare your parenting has been successful? When the child graduates from high school? When he graduates from college? Which college? When he gets a job? What job? When she produces grandchildren for you? Where’s her partner in this? When those grandchildren graduate from something? You see where I’m going here? Meanwhile, until some societally sanctioned outcome occurs, are parents to labor totally in the dark as to their children? The answer to that last one is, in short, yes. Of course. I mean, the labor the parent undergoes to bring a child up to that first societally sanctioned endpoint is gargantuan, takes about eighteen years, costs nearly three-quarter of a million dollars, and is largely unrewarded. Unless you look at successful parenting another way. Which, as I mentioned recently, regarding definitions that appear definite, I’m very happy to do. And really must do. Parenting is a terrific example of how success is both an outcome and a process. Parenting never ends, so if success is simply a particular outcome, such as getting into college, that is, as I’ve said, a very long time to wait to feel successful. 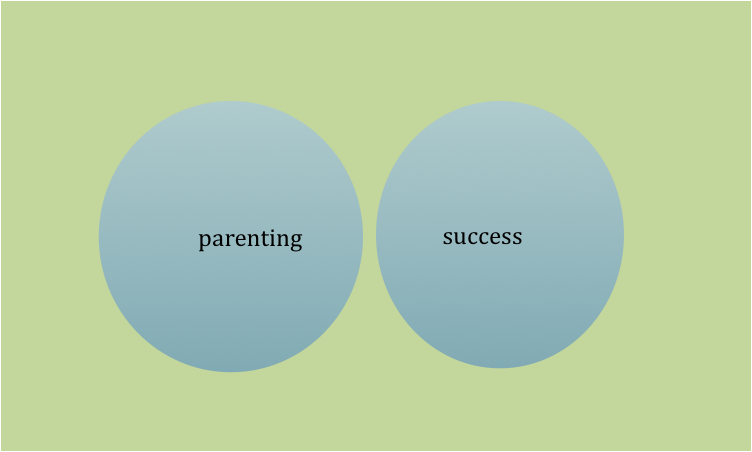 But if success is a process as well as an outcome, then there are many ways to feel successful as a parent. And I’m not just talking report cards and roles in school plays and things like that. Those are also achievements of a singular, granular nature, gratifying but fleetingly so. No, I’m talking about something else. Now the other thing wrong with all those examples listed above is that they have much to do with the parent feeling successful because the child has achieved something tangible - but very little to do with whether the child feels successful. And that’s what really counts, isn’t it? Isn’t it? People? Am I right? So, you want to feel successful along the way, while you raise the child. Otherwise you are in danger of projecting all kinds of goals onto them that are really YOUR goals. To avoid this fate, success can’t be about outcome only. It has to be about process. 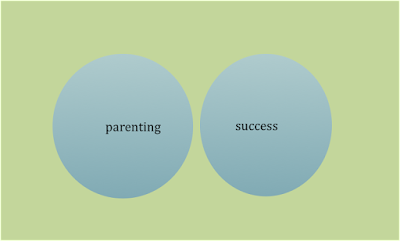 What is the process by which you are a successful parent? More important, what is the process by which you raise a successful child? I’d say it’s by helping your child handle life. Because really, what do we (and here I will revert to “I”, because I’m not going to try to speak for you, Readers) actually want for our children? I want my children to discover a passion, to find a way to work related to that passion that pays them money. I want them to be resilient, to be good citizens, to have well-balanced mental states, to accept disappointment without being crushed, needing extensive therapy or meds long-term, and to have several deep, meaningful relations with others. I’d love for them to fix the environment, or the political system, or to make great art, but I’m trying to be realistic. Today. I’d also like them to produce grandchildren and live near me and want to keep in touch. Not to mention to eventually rue the tight-mouthed way some of them have to speak to me nowadays - you know what I mean, don’t you? The speaking only when spoken to and answering by moving the lips as little as possible. Yes, I would like them to rue that. So then, how to achieve this ambitious list? Helicoptering? That keeps them close - at least for awhile. It could backfire, though, and send them reeling as far away as possible. Free range? That encourages their independence, which could actually work in your favor, via reverse-psychology, and encourage them to settle close by. Tune in next week, when I tackle this question, with a little help from a professional.